Lee Boudreaux / Back Bay Books, 9780316386555, 320pp. One of Bustle's "Most Important Books of 2016"
Grief-stricken after his mother's death and three years of wandering the world, Victor is longing for a family and a sense of purpose. He believes he's found both when he returns home to Seattle only to be swept up in a massive protest. With young, biracial Victor o one side of the barricades and his estranged father--the white chief of police--on the opposite, the day descends into chaos, capturing in its confusion the activists, police, bystanders, and citizens from all around the world who'd arrived that day brimming with hope. By the day's end, they have all committed acts they never thought possible. 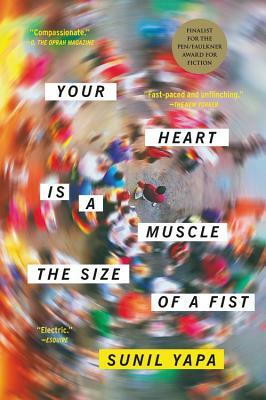 As heartbreaking as it is pulse-pounding, Yapa's virtuosic debut asks profound questions about the power of empathy in our hyper-connected modern world, and the limits of compassion, all while exploring how far we must go for family, for justice, and for love. Sunil Yapa received his MFA from Hunter College, where he was awarded the Alumni Scholarship & Welfare Fund Fellowship and was selected twice as the Esquire Fiction Intern. In June 2010, he won the Asian American Short Story Award. In May 2010, Yapa was the writer-in-residence at the Norman Mailer Writers' Colony in Provincetown, Massachusetts. The son of a Sri Lankan father, and a mother from Montana, Yapa grew up in Pennsylvania, and has since traveled and lived in 48 states and 35 countries. "Your Heart is a Muscle the Size of a Fist is visceral, horrifying, and often heroic. But above all, this book is a full-throated chorus of voices on all sides--protestors, cops, delegates, politicians, and ramblers--as democracy runs headlong into the machinery of global power. Sunil Yapa has achieved something special, a story that is as tragic as it is relevant, as unflinching as it is humane." "Sunil Yapa's debut novel is possibly the most gorgeous book I've read in my entire life... Yapa's pattern of meandering, artful, full-bodied imagery, punctuated by zingy one-liners makes for a seriously addictive read... It's painful. It's gorgeous. I can't say this enough: read it." "Yapa's novel is a much-needed and refreshing pivot point. His novel makes a case for the validity of all opinions in a conflict the better part of two decades old. This rare quality of his work is a practice that many could benefit from in current conflicts, foreign and domestic." "Sunil Yapa's voice and ambition leap off the page. Here is a writer to watch." "As electric a novel as I've ever read."